Thursday is the last day of work for 215 employees at a Carrier plant in Indianapolis made famous when then President-elect Trump struck a deal to stop the factory from moving to Mexico. But despite that deal to keep the plant open, these workers' jobs are still being moved to Mexico. "There's still anger from the folks losing their jobs, even though they knew it was coming," said Kelly Ray Hugunin, vice president of the United Steelworkers local in Indianapolis that represents the workers. "But for others, they're ready for it to be over." The layoff will leave about 730 hourly workers at the plant making furnaces. The workers laid off Thursday make a lower cost component of those furnaces. Even at the time that Carrier agreed to keep the plant open, it said it would go ahead with plans to ship that part of the factory's work to Mexico. These layoffs had actually been postponed; Carrier originally said that the jobs would end right before Christmas. And it originally expected to lay off 290 workers, not 215. This is the second round of layoffs since Trump visited the plant to tout his deal with United Technologies to keep the factory open. More than 300 jobs were eliminated in July. Carrier said that about 60 of the employees let go in the two rounds of layoffs decided to enroll in college and will be reimbursed for four years of education costs. It is also reimbursing vocational technical training for other laid off workers. And every laid off employee will receive both severance and six months of medical insurance coverage. Separately, Carrier's corporate parent United Technologies (UTX) expects to add 5,000 new U.S. jobs over the next three years. 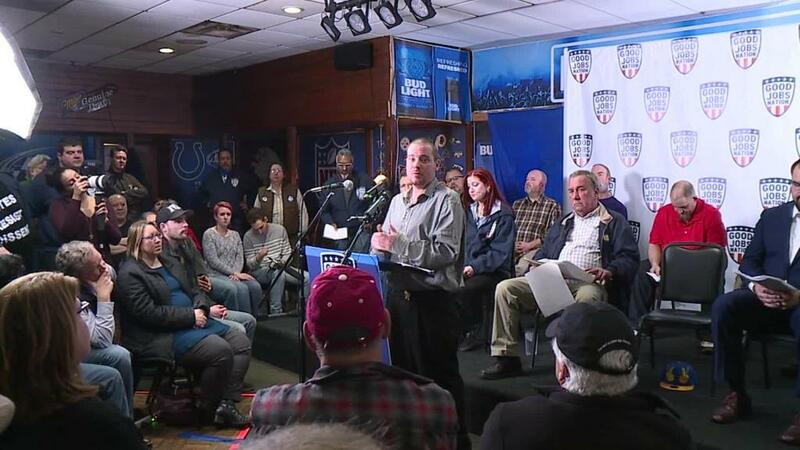 On Wednesday there was a town hall meeting in Indianapolis hosted by Good Jobs Nation, an organization of low-wage workers, that included a panel of several of workers losing their jobs Thursday, according to Chuck Jones, the former president of the USW local in Indianpolis. "The folks who voted for Donald Trump all felt like they were betrayed," said Jones, a vocal critic of Trump even at the time of the deal. "They bought into his promises." Jones says he's worried there are more layoffs coming in the future. Soon after the deal to save the plant was announced, United Technologies CEO Greg Hayes said in an interview on CNBC that the $16 million the company planned to invest in the plant would be spent on automation to make it more efficient. He also said that would mean fewer jobs. Jones worries that beyond the automation job losses, Carrier may still move ahead with plans to close the plant and move all the jobs to Mexico three or four years from now when attention has died down. "I hope I'm wrong about that, but that's my fear," he said. The White House did not respond to a request for comment on Thursday's layoffs.